The birth of an Android (app)! By popular demand, we launched our Android App, designed specifically for easy access to all the Bliss Bringers content. 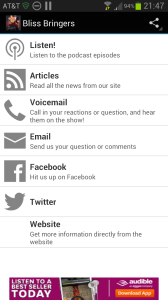 It allows you to download or stream episodes, read our articles and a whole bunch more. No other applications are needed, and you can be sure to always be the first to be notified of new episodes via the advanced notification system. Want to ask a question? Leave a voice comment? Drop us a naughty sext? Alternatively: On your device, open the Amazon App store and search for "Bliss bringers" manually. Note: This application will not work on Apple products (e.g. iPhone). For those, you can subscribe directly in itunes. If neither of these work, you can always use the Stitcher application to stream us!